My bike set up has changed quite a lot since I first dipped my toe into the world of bikepacking. My initial forays were just with a dry bag stuck on the handlebars, held on by a couple of bungee cords. Ultimately though once I got more involved it was clear something a little more durable would be needed to make the whole experience a little more enjoyable. When I started planning for my Tour Divide trip I got myself my Travers Russ Ti, with some customisations to make it a perfect (for me) TD bike. Initially I ordered the frame with Travers own Ti flat bars, needing a decent way of attaching all the kit I stumbled across BarYak whilst googling for ideas. I got the BarYak bars and set it all up, they are really sturdy and work excellently. 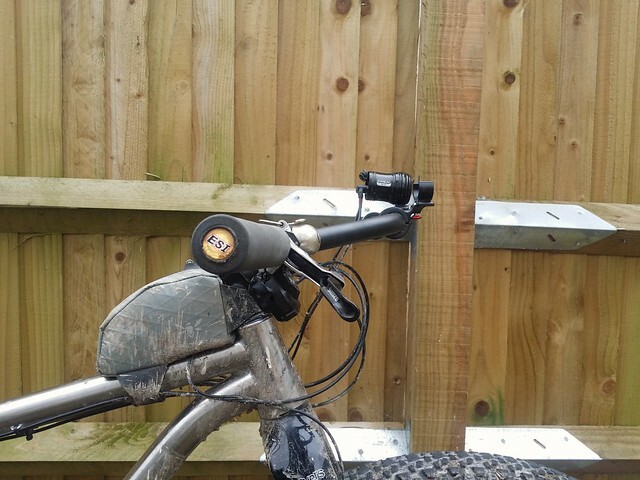 Ultimately for me though I just couldn’t get used to the bend on the Travers bar, it is a lot shallower than what I am used to, so I transferred the BarYak onto Tom’s bike and that is what he used for the Divide, with the standard Trek bar that came on his Superfly. I moved on and then tried the Jones bar. 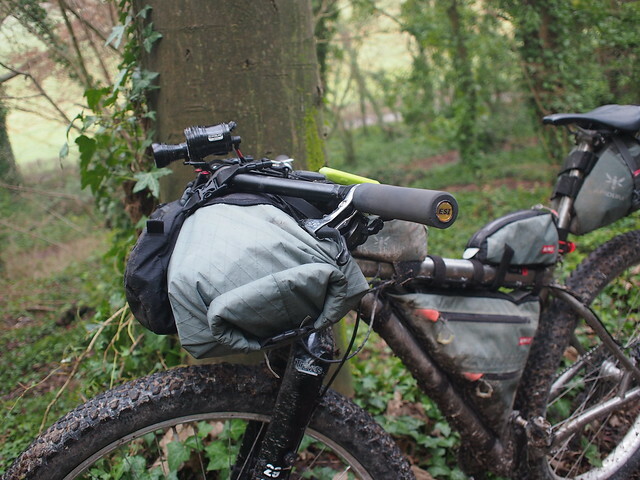 The Jones bar is *REALLY* good, I had it on my bike for the Divide and it was absolutely faultless, so comfortable and if I am ever doing another long trip it will be going back on for the duration as it is just so good. Just excellent for day after day of riding, it gave me very little in the way of aches and pains from my hand position. The fact you can move your hands around when you are tired is great and you can get into a real aero tuck when bombing down those Montana gravel roads too! Ultimately though now my life is back to ‘normal’ after my Divide trip I wanted to switch back to a bar that would give me more of a normal MTB feel for the Travers. As I’m only likely to be doing one bivvy a month and maybe a couple of two night trips this year the bulk of my riding on the Travers will be unloaded. 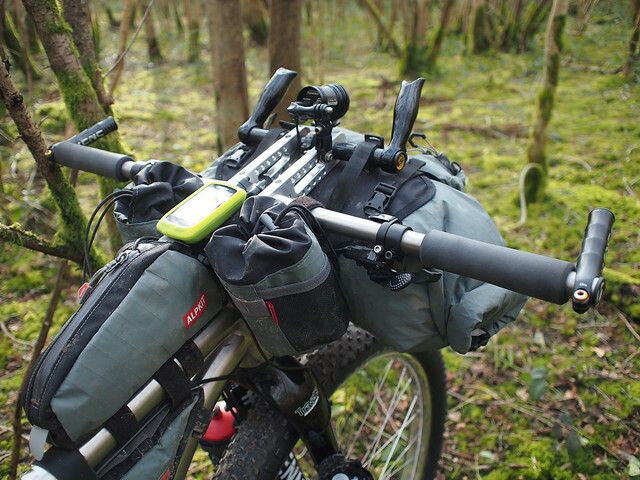 The new Alpkit Confucius bar gives you a normal MTB like handlebar position and you still have the loop to attach your luggage when you need to. To me the bend was far more what I’m used to on my other bikes and it brings back the rowdy trail feel to the Travers that it just lacked a little with the Jones bar on it. What’s more it’s at a great price too. Here’s a couple of unloaded photos to show the clearance and the bar position I use. As you can see I have my bars up a bit with a few spacers under the stem, this gives me about 280mm of clearance, which is more than enough for the Apidura bar bag. 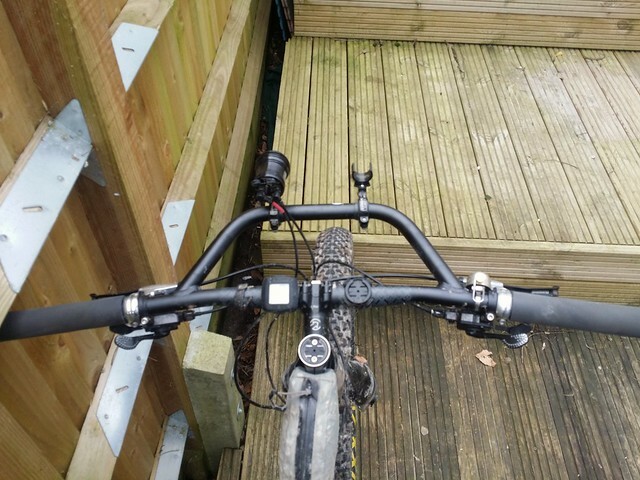 I have the bar tipped up slightly, this gives me the sweep angle of the handlebar that I find the most comfortable. I found that if the loop was more level the sweep of the handlebar was not as comfortable. So with it slightly tipped up the sweep angles back nicely. 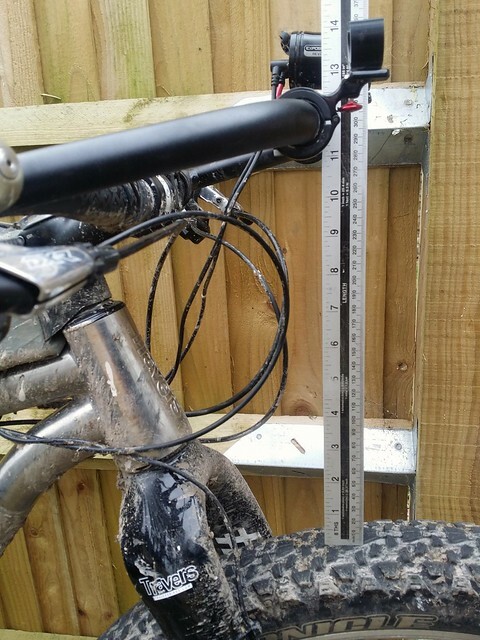 The only negatives I found were the bars were actually wider than it said on the Alpkit web site, though that is not really a problem for most, you can always cut them down of course. Just make sure that if you do cut them down you measure and don’t take the cut marks on the bar as gospel as they are not correct. Well I’ve taken them back off again! 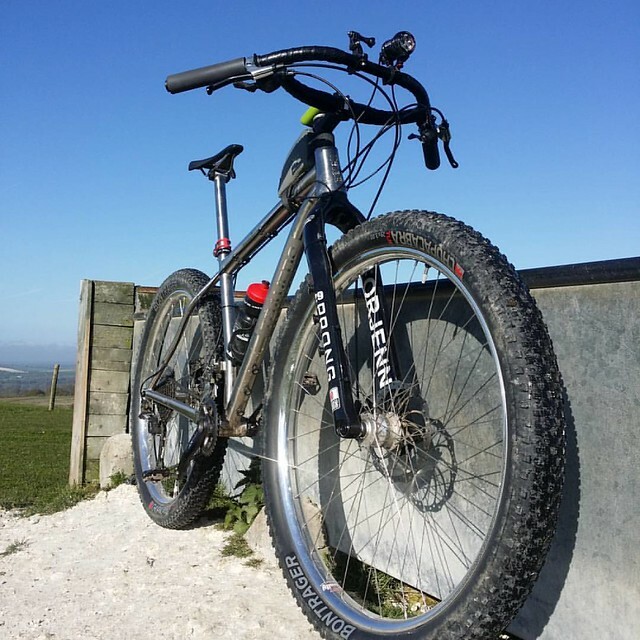 I attempted a South Downs Double, which didn’t quite go to plan, however in the few days after I found that my palms and my shoulders felt really bruised and battered. So I’ve gone back to the Jones bars. I’ve got a couple of really long rides coming up in the next few weeks so I’ll have the opportunity to contrast again and make my mind up finally. 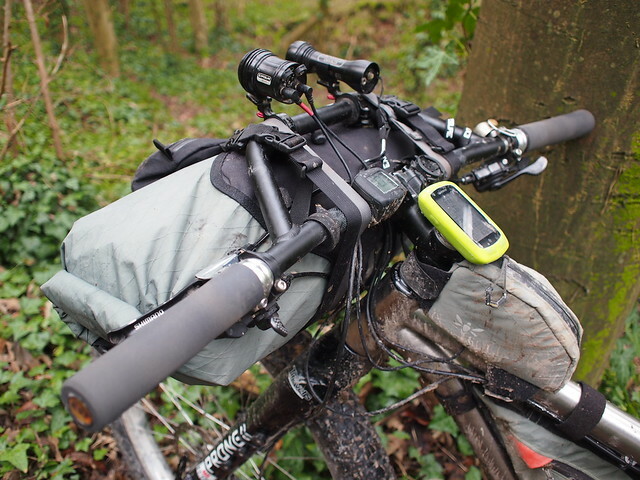 In reality I think the heavier thickness tubing that the Alpkit bars use, just doesn’t flex and absorb the vibrations the way the Jones Bars do. Hmmm – those Confucius bars look intersting. 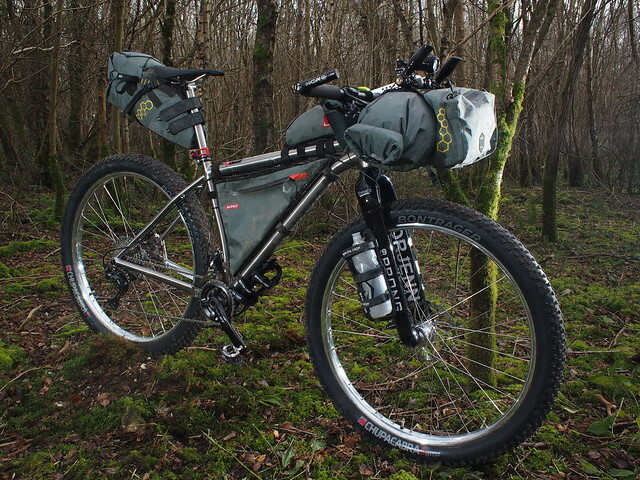 Definitely interested in putting them on my current bike packing bike (a 26er) and they might even make my 29er usable, as they would move the drybag further forward so that it doesn’t foul differently angled brake hoses on that bike. The only downside is that my brakes/shifters mount separately, rather than on matchmaker brackets, like I think yours do, so there might not be enough space to fit these. Nice setup! 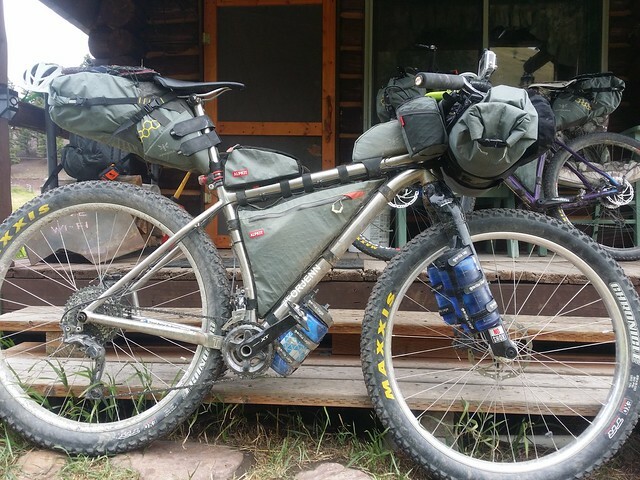 And great information about the Tour Divide! Thanks very much! I’m interested in the Baryak-setup which ended up on Tom’s bike. Wasn’t Tom missing the padding/rest/support for his elbows to use the forward positioned bars of the Baryak extension? Why did you chose the option without them? Hi, at the time the armrest part was still in development. That and I was really short of cash, unfortunately the wonderful UK customs department really stung me on the import duty too, so it ended up costing a fortune! As you saw it ended up on Tom’s bike as I was just happier with the Jones bar. Tom did use the extensions with no issues and we had several days where we had really bad headwinds and it really helped. A few times he was really hard to keep up with he was descending so quickly! I’d definitely recommend the BarYak setup, if you have a handlebar you are happy with then it works really well. The newer version is lighter and a bit more refined and also, as you have seen, has the armrests too now. Hope that helps, Jimbo. I’ve found suppliers for bar extensions for lights and such which I think can be used for the same thing as you did with yours. And they only cost a couple of dollars and come without rests as they were intended for lights to be mounted.. But don’t know the quality yet. Hi. Interesting review. 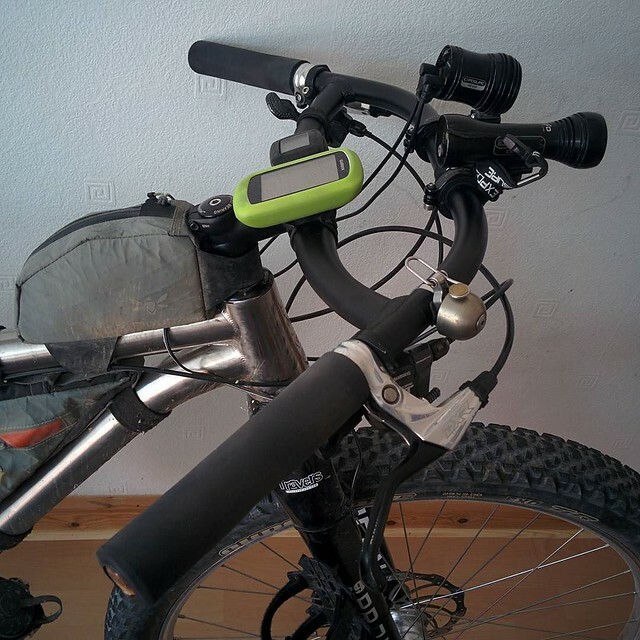 I’m looking at getting some Confucius bars for my fat bike as I want to retain some of the shape of a normal mtb bar. Just a couple of quick Qs. Firstly how much wider were they than the 760mm? Secondly, given I’ll run them on a bike with 4″ tyres at 6psi do you think that should help with the stiffer build of the bars? Hi, I think mine were 780 in the end, but that’s OK, you can always cut them down, just measure it first! I’m sure if they’re going on a fatty it won’t really be an issue for you. Cheers, Jimbo. What sort of bell is that? It looks suitably impressive and loud. That’s the Spurcycle bell, it was a birthday present, as they are so expensive it’s a bit of a luxury item! So loud though and very well made, recommended for sure.